As a landscape architect and all-around plant lover, I enjoy arranging plants to create compositions. Combining the forms, textures, and colors of different plants is like painting a picture, but in 3 dimensions. I don't have a yard, so I have to get my fix of green with potted cacti and succulents in my little apartment and on my porch. 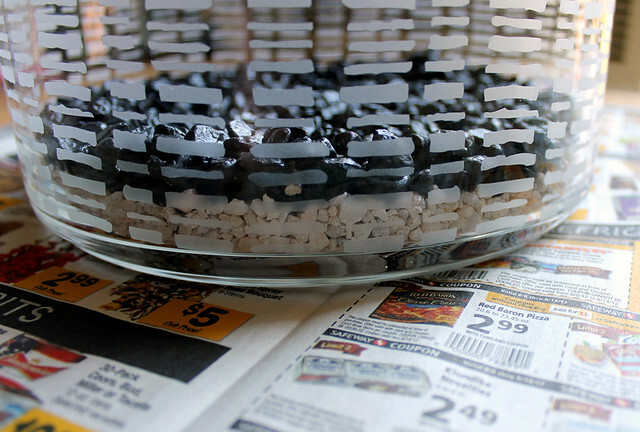 Creating dish gardens is one of my favorite weekend projects. I'm frequently repotting and rearranging my succulent collection in new ways, to keep things interesting, incorporate newly acquired plants into my collection, and to respond to the needs of the plants. I'm going to outline how to go about creating a dish garden in a container without drainage holes, because some of the best containers weren't originally intended for plants! I don't have a drill or a masonry drill bit, either, so adding holes isn't an option for me, but if you do, by all means, add holes! A dish of your choice. 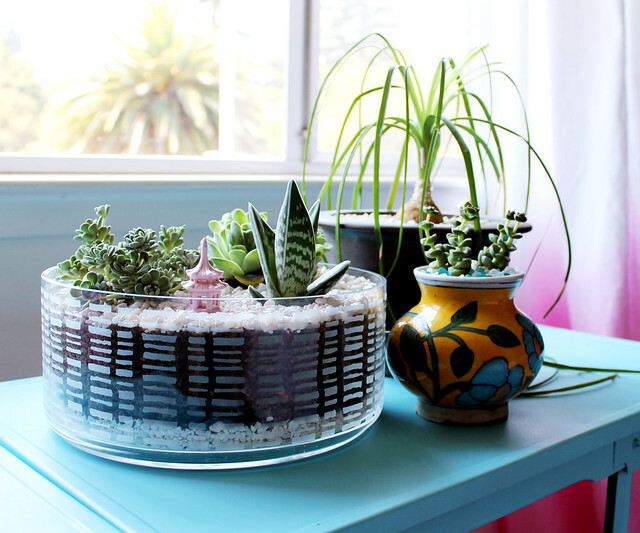 Succulents have compact root systems, so you don't need to use something with a lot of depth. I'm using this wide glass bowl that I got on clearance at Target many years ago. Succulents. When choosing the plants to go in your garden, it's best to select plants with some contrast in their form and/or color. All of mine are in the blue/gray family, but each has a varying form (rosette, small scale, and spiky). Contrast is good! Cacti and succulent soil. It is always best to use the appropriate soil for your plants. 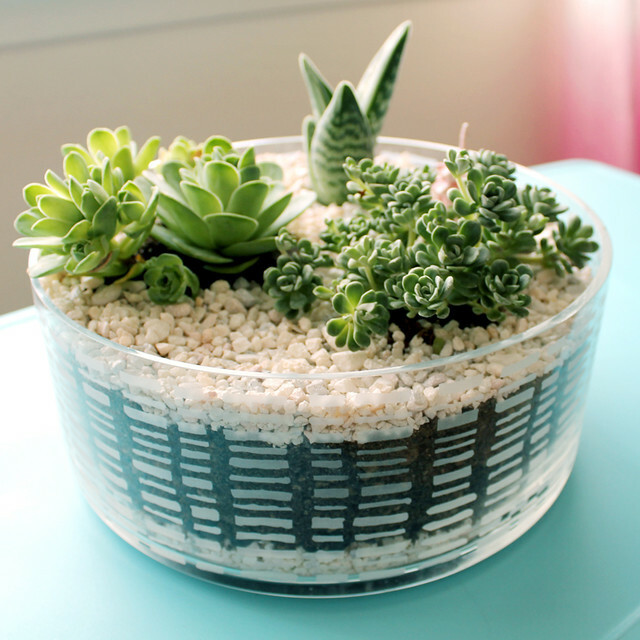 Succulent soil has high levels of sand and light-weight porous material, which encourages water to drain. These plants hate soggy roots, so well-draining soil is essential. Decorative gravels. Here's a little trick of mine: skip the bags of gravel at your local nursery, and head to the pet supply store instead. 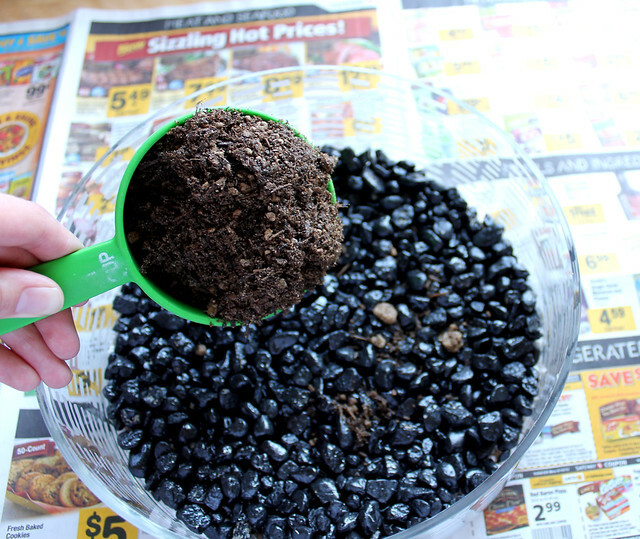 The aquarium gravels that they offer are much less expensive, and you can often find many fun colors to choose from. I chose a fine white, a chunkier black (for drainage) and pretty sea glass for an accent. Lets get started! Since my container is transparent, I wanted the layers to pop. So instead of placing the black drain rock right at the bottom of the dish, I added a layer of the white gravel, to create a stripe. Then I added a layer of the black rock. The larger rock creates more air pockets, which means more places for excess water to hang out, keeping it away from the roots of your plants. Decide on an arrangement for your plants. Odd numbers generally look better in these types of arrangements. I'm using three, so I just used a triangular spacing. Infill with soil and make sure your plants have a sturdy footing. 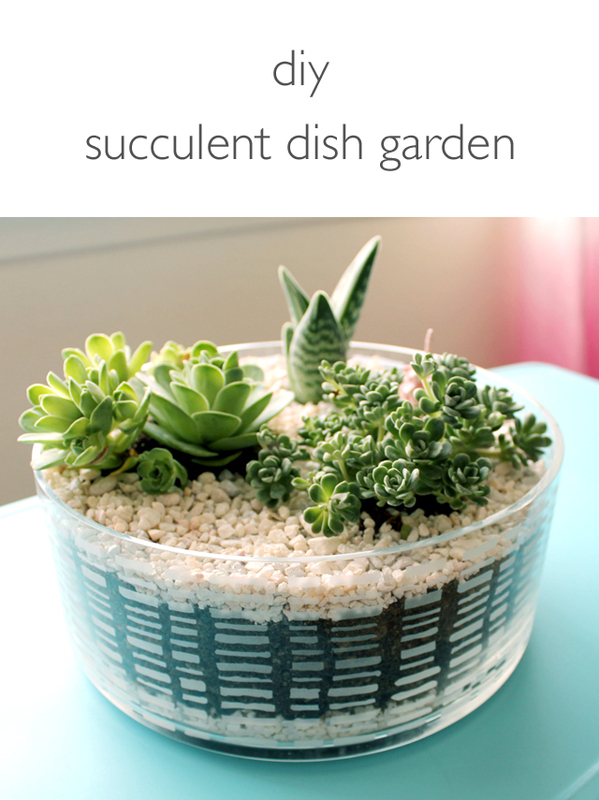 Top off with a layer of decorative gravel to cover the soil and give your dish a finished look. Make sure the top of your gravel is below the top lip of your container. 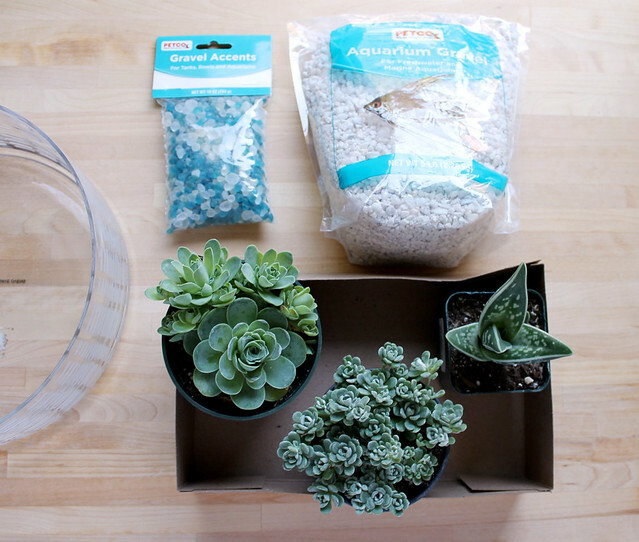 Resist the urge to water your succulents right away. If the roots were damaged during planting, they are more susceptible to fungus and bacteria during this time. So, let it be for a week or two before you water it. 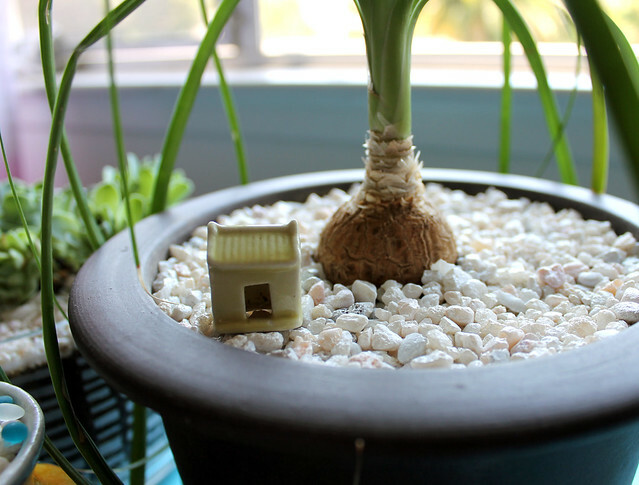 Here's one of my favorite parts: I like to place accents in my dish gardens, whether it's a single lava rock, a piece of fools gold, a painted stone, or a miniature ceramic figure. I got this great little ceramic pagoda at a bonsai shop and thought the pink really complimented the colors of the rock and the plants. 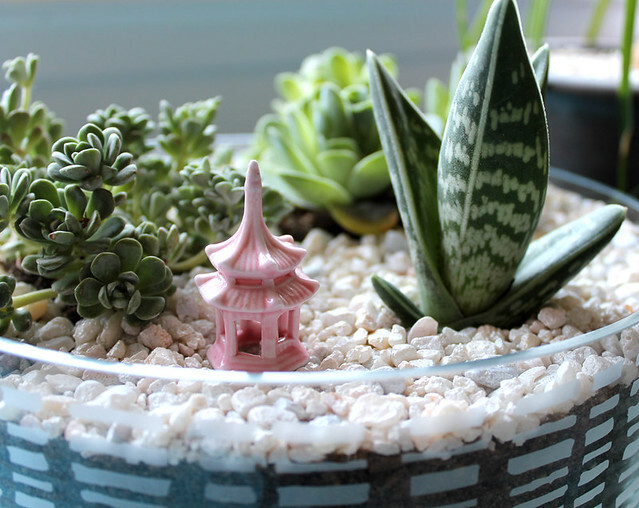 Find a nice spot for your new mini garden and enjoy! 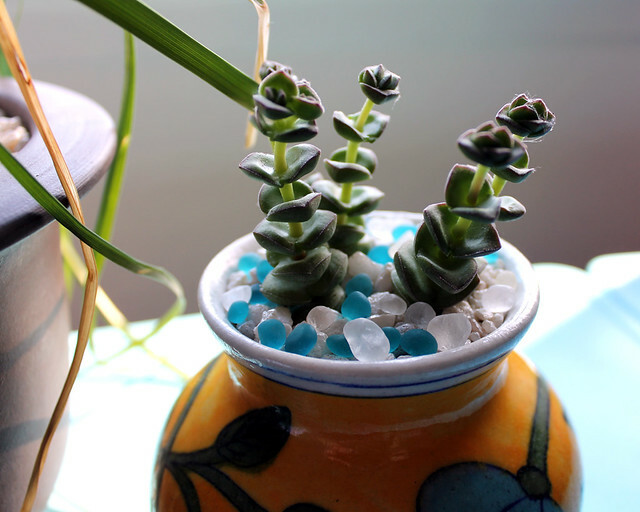 I had a bit of gravel leftover, so I topped off a few of my other house plants and added the sea glass to this succulent in a repurposed vase. Cute, right? It's Labor Day weekend! Have a good one! P.S. 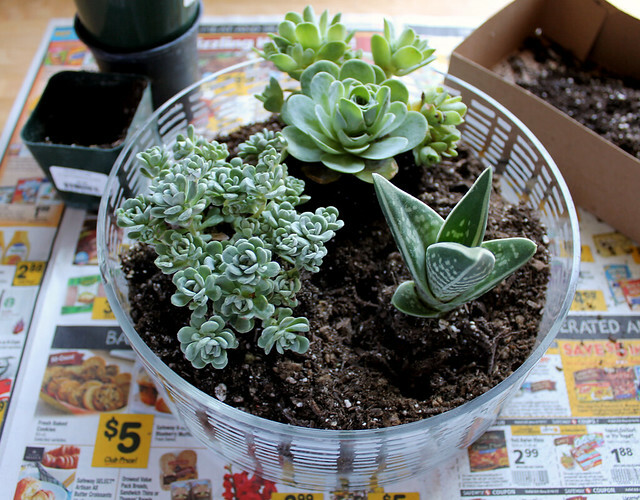 Make a dish garden for Halloween! I had no idea you shouldn't water right away! Lots of good tips and I love the end results. Wow! Those dish gardens are really lovely. They are so cute! Thanks a lot for the share. Great tutorial - and very nice pictures! Thanks! This is a fantastic post. I love the end result and the wee pagoda just tops it off! Great instructions. I really want to make this! So how do you water without a drain hole? Tip the excess water out?